An individual link detached house very conveniently located in the centre of Llandudno close to all local amenities and just a stones throw from the promenade. This surprisingly spacious house has the added benefit of off road parking for two vehicles which is unusual for a town centre location and in brief comprises good size kitchen with dining area and utility off, lounge, three double bedrooms and spacious shower room. Modernised by its present owner this spacious home has central heating, double glazing and would make a perfect holiday home. ENTRANCE HALL 11′ 7" x 5′ 4" (3.54m x 1.63m) With smoke alarm, radiator, built in cupboard housing electricity consumer unit, under stairs storage area, carpet, power points, stairs leading to first floor landing and doors leading off. KITCHEN 21′ 1" x 9′ 3" (6.43m x 2.82m) Having a range of modern black high gloss wall and base units with black granite effect complementing work top surfaces over, Perspex splash back, inset stainless steel sink unit with mixer tap, breakfast bar with built in TV/DVD/radio over, space and plumbing for dish washer, space for electric oven with extractor fan over, space for American fridge freezer, wall mounted condenser gas fired central heating boiler, laminate flooring, inset spot lights, radiator ,double glazed window to the front with fitted window blind, power points, double glazed window and door to the side giving access to the car parking port. UTILITY ROOM 8′ 5" x 4′ 11" (2.57m x 1.51m) Having a range of white wall and base units, work top surfaces over, space and plumbing for washing machine, space for tumble dryer, laminate flooring and power points. 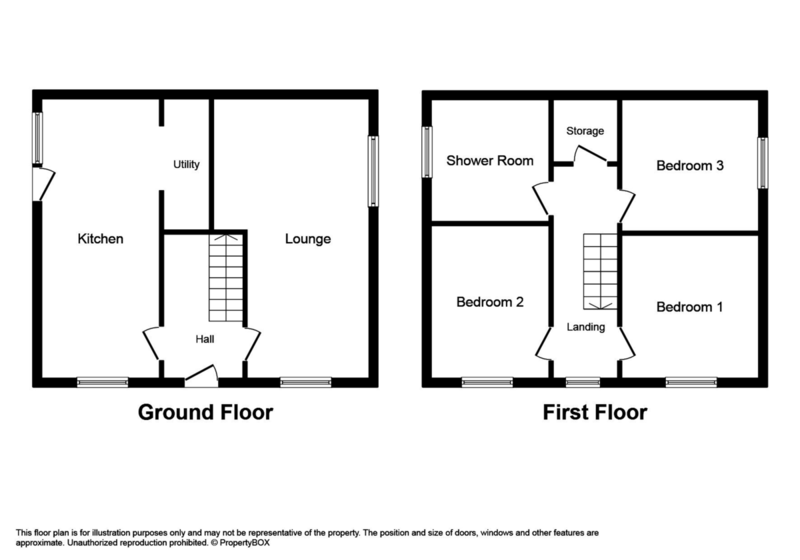 LOUNGE 21′ 0" x 12′ 7" (6.41m x 3.86m) Having double glazed windows to both the side and front with fitted window blinds, feature exposed ceiling beams, feature brick fireplace, radiator, carpet, TV point and power points. STAIRS LEADING TO FIRST FLOOR LANDING 16′ 2" x 5′ 6" (4.95m x 1.68m) With built in storage cupboard, fitted ceiling light, double glazed window to the front with fitted window blind, radiator, carpet, power points, stairs leading to loft space and doors leading off. MASTER BEDROOM 12′ 1" x 11′ 9" (3.69m x 3.60m) With double glazed window to the front, radiator, carpet and power points. BEDROOM TWO 12′ 2" x 10′ 6" (3.71m x 3.21m) Having double glazed window to the front, radiator, carpet and power points. BEDROOM THREE 11′ 9" x 8′ 3" (3.60m x 2.52m) Having double glazed window to the side, radiator, carpet and power points. SHOWER ROOM 10′ 6" x 8′ 2" (3.21m x 2.49m) Having a white three piece suite comprising large walk in shower with shower over, wash hand basin and low flush WC. Part tiled walls, wall mounted chrome heated towel rail, radiator, inset spotlights, laminate flooring and double glazed obscured window to the side. OUTSIDE The front of the property is enclosed with low stone walling and to the side is parking for up to two vehicles. DIRECTIONS From our Llandudno office turn right onto Madoc Street, at the junction proceed straight across onto Chapel Street, take the second turning on the left onto New Street, the property can be found on the left hand side. SERVICES Mains gas, electric, drainage and water are all believed connected or available at the property. All services and appliances have not been tested by the selling agent.